Did he have spots on at any stage? Would you like some of the Cowley Decal Cº smaller 'Surefire Spark Plugs' decals as well then Noel? I'll drop you a PM. I'm not sure about the spots on the 1000 Lakes Noel, but I have photos of him on the RAC with them on. That was the only other time Harri used C96 KOG and it was in virtually the same livery. Leave your 1000 Lakes / lamp pod query with me for a bit and I'll look into it for you. Thank you Ted - most kind! Very good Noel, 'stage' on a rally lol! Superb build David. The attention to detail is excellent. Great will have to make a start. Now would you happen to know the photographer that snapped a pic over that jump? newt5550 wrote: Superb build David. The attention to detail is excellent. Ryan_C wrote: Top work there Dave! Many thanks Chris & Ryan - that is very much appreciated. 143models.com wrote: Great will have to make a start. Any jump in particular Noel lol? Lovely work there, makes for a strikingly different model. Top stuff! I echo the comments in the previous posts. Well done that man! A somewhat belated many thanks Steve & George - much appreciated. My latest project is progressing rather slowly at the moment, however I should be able to get some work done on it this evening. All of the detail paintwork has now been completed, lights fitted, glass fitted, etc but just as I was about to start decalling it, I realised that it shouldn't actually have any front side indicators fitted! I therefore need to file them off, touch up the paint, and then let them dry before I can finish the decal work. 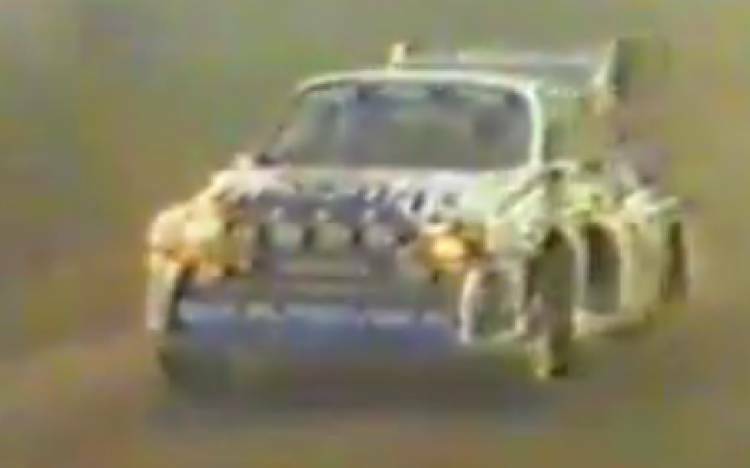 So might that be a rallycross project then with no indicators, David? Have finished two projects over the Bank Holiday myself, a series one Rover 3500 V8S in Triton green (a Heller 1/43 kit) and a Sherpa van for my folks' 50th wedding annversary. I've decaled it up with photos from their wedding and more recently too . Next up is my Ternco 6R4: was removing the lower tailgate spoiler last night before I finish painting and start decalling! Sorry to disappoint you Steve, but it's not a rallycross 6R4 mate! I'm actually building up my white bodyshell (above!) into David Llewellin's 1986 Circuit of Ireland Rally winner C996 LCA, with decals from an obsolete RPM resin kit, similar to Dave's 1986 National Breakdown Rally model - which also used RPM decals. I do however have another FOUR 1986 rally versions on the go as 'work in progress' at the moment, and ONE rallycross car! The latter might take a little longer to complete however due to the work involved to the bodyshell, and the fact that I will also have to create my own decals. Yes, the rallycross boys tended to run their cars with a few mods and we can't ignore those in 1/43rd land! I've got a collection of front spoilers here now!! The above David Llewellin 1986 Rothmans Circuit of Ireland Rally model is now finished, and on display with the rest. I just need to wait ill the weather improves so that I can take some photos of it in the daylight, so you might not see it for a couple of weeks depending on what the great weather man in the sky has in store for us! 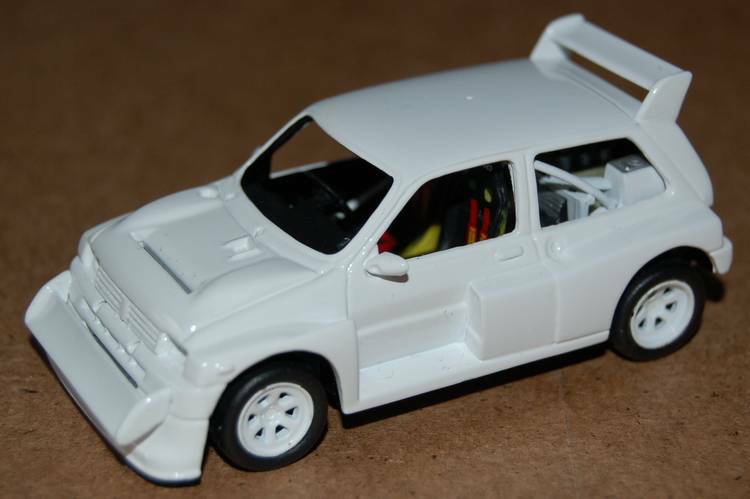 My first rallycross 6R4 is now taking shape. I'm not sure when exactly it will be finished, as there's a fair bit of the base model that needs changing, the decals will need originating, and the correct paint colours need sourcing - but I am in no rush to balls it up, so you'll just have to be patient! No clues what it's going to be by the way - it's Top Secret! ...you are also VERY MUCH COLDER Steve - you guessed incorrectly mate, it isn't Lawrence's! Fits all of the criteria, but NO it's not one of Denis' cars either. That's it!... NO more clues... NO more guesses... NO more hot or warm... ...you'll just have to wait! Just keep me a set of those decals. Cowley wrote: Fits all of the criteria, but NO it's not one of Denis' cars either.